Having delivered a career best with 2016's acclaimed Proponent For Sentience - the band's first attempt at a true concept album - they toured hard in support of it. In the midst of this came an adjustment to the lineup, with the departure of longtime bassist Corey Archuleta and the addition of Brandon Michael. "Musically, Brandon brings a huge new dimension," McShane enthuses. "He has this wide breadth of music knowledge and stylistic proficiency that he draws from with excellent taste, and this makes a lot of the songs on 'Apoptosis' comes to life." Written and tracked in the midst of touring, the heavy schedule also affected Allegaeon's approach to the making of the record, guitarist Greg Burgess asserting that they "didn't have time to agonize over the songs - and honestly we didn't know what the record was going to be until we were putting on the finishing touches!" Regardless, the sheer anger driving a great many of the songs is palpable and unmistakable, with the opening to "Metaphobia" feeling like the end of the world as it thunders down, and "The Secular Age" truly seething. "After I turned 23, all my sad thoughts just turned into rage - sweet, sweet rage - so instead of taking that out on people around me, I decided to take it out on my guitar," explains Stancel. "I always like it when bands sound absolutely pissed on their recordings, and I tried to capture that same aggression on both those tracks. Along with that, I also love adding subtle layers to songs to make them as big as possible." For those unfamiliar with the term, in science Apoptosis is the death of cells, which occurs as a normal and controlled part of an organism's growth or development. 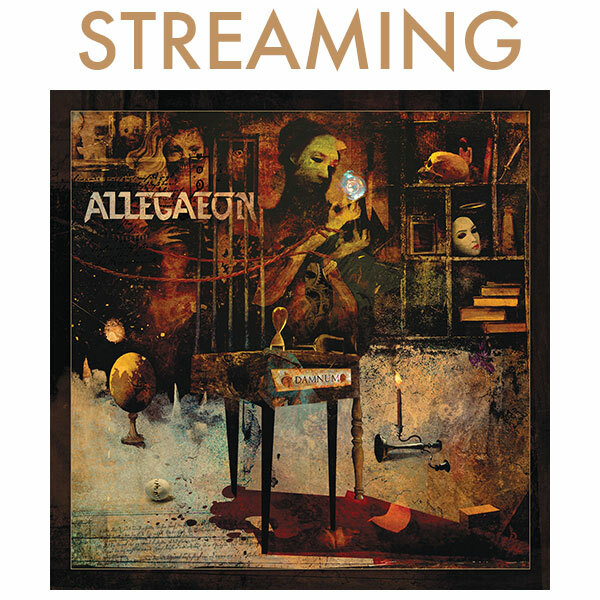 For Allegaeon, this made for a succinct title due to the lyrical themes of the record being rooted in the idea of death leading to new and better life. "Be it in science, society, religion or philosophy, this idea rings true and can be observed throughout history, both told and currently unfolding," states McShane - but there is also a second layer to the choice of title, that applies to the growth and change of the band itself. "Allegaeon has been through a lot of members, but we've always continued to move forward and in an upward trajectory. With this current lineup, we feel that we are finally in a position where there are no weak links. It took a lot of loss to get here, but, in the end, it was all worth it for the overall growth of the band." Tracking at Flatline Audio in Denver with long-serving producer Dave Otero (Cattle Decapitation, Cephalic Carnage) proved a largely stress-free process, allowing the band to bring in classical guitarist Christina Sandsengen to duet with Burgess on "Colors Of The Currents". While in the studio, they also had the time to record a bonus song, and while on Proponent they chose to cover a Rush track, this time around they were pulled in a more classical direction, delivering their take on JS Bach's "Concerto In Dm (BWV 1052)". Having always held a special place in Burgess' heart, particularly Murray Periah's version with St. Martin of the Fields Academy, he has long been eager to write a metal interpretation. "When I was having writer's block for the album, I decided to bite the bullet and arrange it. It was a huge undertaking and truly a life accomplishment for me." A further noteworthy achievement lies in 2018 having marked the 10th anniversary of Allegaeon's debut EP, and to have not only made it so far but to see the band continuing to build momentum as they storm into 2019. "We've come a long way in that time, and I'm extremely proud of what we've achieved," Burgess states. "Not only have we continued to grow from album to album despite personnel changes, every lineup change has been a huge improvement for morale. And now I can just look at our touring schedule for the coming year and know we're doing well."